RUSSELL SCOTT STEEDLE & CAPONE ARCHITECTS INC. is an architectural firm specializing in multi-family housing, medical, and commercial projects primarily for institutional and owner/developer clients throughout New England. This team of experienced registered Architects has been responsible for 8,000 apartments in forty major developments, hundreds of institutional renovation projects, and many other retail, laboratory and commercial projects for a total construction value of $900,000,000. Historic preservation, and renovation and re-use of historic structures has become an increasingly important part of the firm's work. 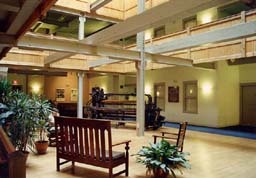 The Massachusetts and Boott Mills complexes renovated for housing and offices are part of the most historically significant group of early 19th century industrial structures in the U.S.
Russell Scott Steedle & Capone have been serving institutional clients,especially colleges and universities in designing technically demanding projects. The firm is specialists in the design of library shelving facilties, involving environmental requirements for the preservation of the collections. Institutional clients have included Harvard, Yale, Cornell, Columbia, Princeton, Mass. General Hospital, JCHE, Williams College, and the City of Cambridge. 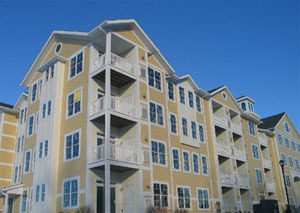 The firm specializes in the design of multi-family housing for institutional and owner/developer clients, most of which have been financed using federal and state programs for subsidized and market rate tenants. We have developed long-term relationships with the Corcoran, Jennison Companies, Joseph R. Mullins Company, Roy & Madden Inc., and John M. Corcoran Co.
RUSSELL SCOTT STEEDLE & CAPONE ARCHITECTS INC. was founded as Hugh Adams Russell Architects Inc. in 1977 with staff from Massdesign, where Hugh Russell was a founding principal. In 1985, Bruce Scott joined as a principal, and the firm became Russell & Scott Architects Inc. Craig Capone and James Steedle also joined the firm at that time, becoming principals in 1990. The name of the firm changed to Russell Scott Steedle & Capone Architects Inc. in 1998. Perhaps the best testimony to the effectiveness of Russell Scott Steedle & Capone's approach and abilities is that we continue to serve clients we started serving in the 1970s and 1980s. We have become established members of teams that have done many successful and enjoyable projects together, producing successful and attractive housing and work environments for thousands of people.